In her book, Irena R. Makaryk, who is professor of English at the University of Ottawa, brings into focus a country which, until fairly recently, has been seen by the majority of Shakespeareans as part of a monolithic cultural empire under Moscow rule. With the benefit of hindsight, it would seem that there hardly could have been a better timing for the publication of Makaryks study than the year which also saw Ukraines Orange Revolution. For political reasons, the subject of Ukrainian modernism attracted only little attention by Soviet scholars, whereas in the West critical interest in this period has mostly been limited to Russian-speaking authors and directors. 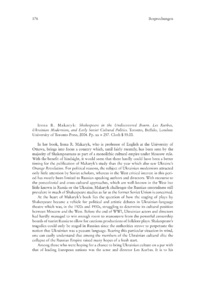 With recourse to the postcolonial and cross-cultural approaches, which are well-known in the West but little known in Russia or the Ukraine, Makaryk challenges the Russian-centredness still prevalent in much of Shakespeare studies as far as the former Soviet Union is concerned.